ATLANTA, Feb. 1, 2019 /PRNewswire/ — Multiple EMMY® winning TV/film producer, social media influencer, entrepreneur, and branding guru Rushion McDonald, hosts an expansive lineup of guests this February on “Money Making Conversations.” Featuring compelling conversations on self-empowerment and sharing keys to succeed in balancing careers and a healthy life, pursuing business ownership, navigating today’s tech and more, McDonald delivers a mix of expertise and entertainment on every show, to inspire listeners to invest themselves in boldly going for their dreams, no matter what age. 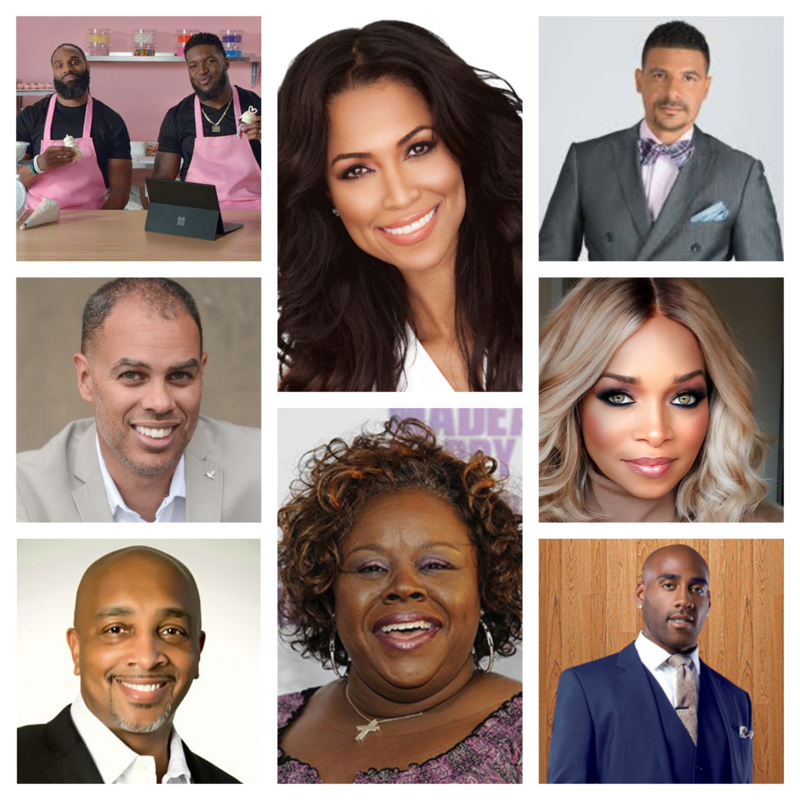 The month of February on “Money Making Conversations” will include former NFL pros who’ve created new ventures, actors, life/relationship coaches, award-winning producers, motivating speakers, and fitness, food, and beauty entrepreneurs. “Money Making Conversations” is hosted by Rushion McDonald and produced through his multimedia company 3815 Media. “Money Making Conversations” can be heard live every Monday on Atlanta’s biz1190-AM from 10AM-Noon ET, with a replay every Friday 10AM-Noon ET, and every Sunday at 3PM ET. The show can be heard on SiriusXM Channel 141 on Howard University Campus and SiriusXM Channel 142 on HBCU Campuses, and episodes can also be downloaded on iTunes, iHeartRadio podcast, Google Play, Stitcher, SoundCloud, and seen live on the Money Making Conversations Facebook page. The lineup of talent* expected on “Money Making Conversations” in February include: Brian Orakpoand Michael Griffin, Former NFL Pro Bowlers and Co-Owners of Gigi’s Cupcakes (Austin, TX); Jesse Collins, CEO of Jesse Collins Entertainment, award-winning entertainment producer (new BET series “American Soul,” “The Bobby Brown Story,” “Real Husbands of Hollywood,” “BET Awards,” “Soul Train Awards”); Tracey Edmonds, EMMY-winning TV/film producer, Founder of lifestyle, health & wellness brand AlrightNow; Celebrity fitness & nutrition expert/author Obi Obadike on his New Year’s Resolution Challenge; DeAngelo Hall, Former NFL Pro Bowler, Fox Sports 1 analyst, 1st Down Real Estate Group with Partners John Albittar andMohammed Waseem; Pat Smith, Founder & CEO of Pat Smith Enterprises, Producer, Minister, Author, Speaker, Philanthropist/Co-Founder of Pat & Emmitt Smith Charities; Cassi Davis, Actress/singer (Tyler Perry’s A Madea Family Funeral, “Tyler Perry’s The Paynes”); Karimah Westbrook, Actress (The CW’s “All American”), Writer, Producer; Melanie Wideman, Owner and Designer of A Little Slice of Heaven Bakery, contestant on Food Network’s “Winner Cake All”; Dr. Steve Perry, Renowned education speaker, Daytime TV host “Breakthrough with Dr. Steve Perry“; Charles Gregory, Celebrity hairstylist and wig designer (Tyler Perry, Halle Berry, Jeffrey Wright), Creator of The Renowned Wig Collection, Owner of Charles Gregory Blow Dry & Beauty Bar; Constance Schwartz-Morini, Co-Founder of SMAC Entertainment, a talent management, production, development company (with sports/broadcast talent including SMAC co-founder Michael Strahan, Deion Sanders, Erin Andrews, etc. ); Captain Paul Matthews, Founder of Buffalo Soldiers National Museum; Calvin Quallis, Founder of men’s grooming brand Scotch Porter; Kimberly Smithand Amaya Smith, Founders of Washington DC beauty shop Brown Beauty Co-Op; Stephanie Humphrey, Technology & Lifestyle Expert; and Dr. D Ivan Young, Certified Master Coach and Relationship Expert. Hailed as a creative business and branding maven, with a visionary global expertise that has crafted a portfolio of success in diverse fields, Rushion McDonald has executed multi-million dollar deals across various industries, written and produced for Kevin Hart, Taraji P. Henson, Gabrielle Union, Jamie Foxx, and most notably he is the architect of Steve Harvey’s multi-media entertainment career. He is a former IBM executive. Heading his company 3815 Media, Rushion McDonald continues to be a trusted leader and voice for entrepreneurship and entertainment, through “Money Making Conversations” and social platforms.